Everyone loves their eyeliner, but it’s apt to say we love a good bargain even more. For something that most of us use every day, it helps to get it at a lower price. That’s why we picked five popular eyeliners under INR 499 that have good consistency, are easy to apply and are long lasting too. This one’s a real gem at the price. It lasts forever (okay, no but for a long time anyway) and is so easy to apply. Its smooth brush allows you to apply the liquid liner evenly, in a single stroke. It’s dark and you can easily go the whole day without having to touch it up. 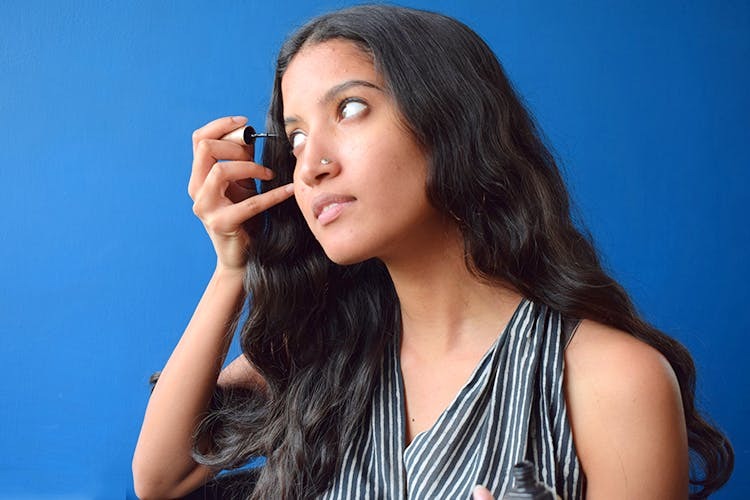 Clumsy folks, the Nykaa Black Magic Liquid Eyeliner is so easy to apply, even beginners will get the hang of it in a jiffy. It’s water resistant and smudge-proof and won’t run down your face when you’re having a bad day. The applicator is super fine and ensures smooth application. The liner has a unique Flexi-cushion tip that gives you control over the kind of thickness you prefer. It helps you with a subtle, thin line and works to achieve a more dramatic, winged affect, if that’s what you want. It comes in five different colours, has a conical tip which is easy to use and helps achieve that smokey eye look. It doesn’t fade and literally glides across your lids. For those of you who find gel eyeliners easier to use, The Maybelline New York Eye Studio Lasting Drama Gel Eyeliner is long-lasting and even though it’s very dark, it comes off easily with any oil-based make-up remover.